An intricate network of minuscule crevices adorns the skin surface of the African bush elephant. By retaining water and mud, these micrometer-wide channels greatly help elephants in regulating their body temperature and protecting their skin against parasites and intense solar radiation. 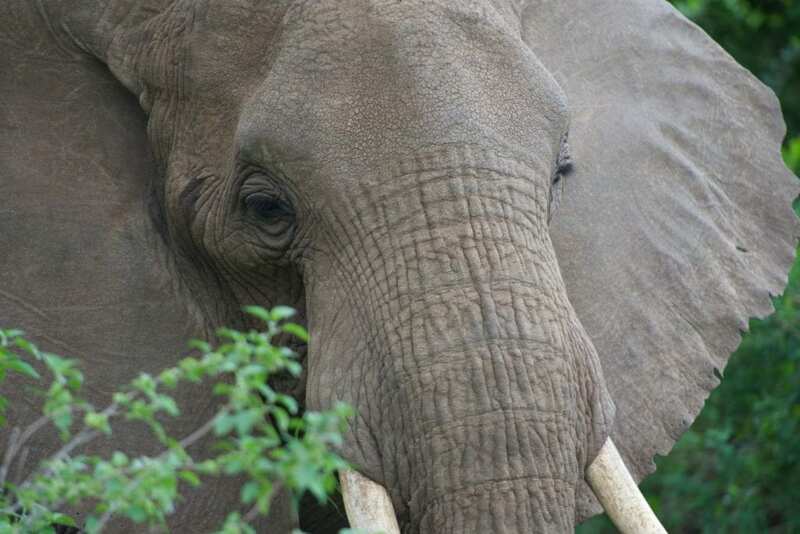 Today, researchers at the University of Geneva (UNIGE), Switzerland, and the SIB Swiss Institute of Bioinformatics report in the journal Nature Communications that African elephant skin channels are true fractures of the animal brittle and desquamation-deficient skin outermost layer. The scientists show that the elephant hyperkeratinised skin grows on a lattice of millimetric elevations, causing its fracture due to local bending mechanical stress. African elephants are well-known to love bathing, spraying, and mud-wallowing. These behaviours are not just for fun. Indeed, African elephants lack the sweat and sebum glands that allow many other mammals to keep their skin moist and flexible. Furthermore, because of their huge body size, and their warm and dry habitat, African elephants can avoid over-heating only by loosing calories through evaporation of the water they collect in and on their skin. By covering themselves with mud, African elephants also avoid the attacks of relentless parasites and the excessive exposure of their skin to solar radiations. Very close inspection of the African elephant skin indicates that, in addition to its characteristic well-visible wrinkling, the integument is deeply sculptured by an intricate network of minuscule interconnected crevices. This beautiful fine pattern of millions of channels prevents shedding of applied mud and allows spreading and retention of 5 to 10 times more water than on a flat surface. Thanks to skin samples provided by scientists and museums in Switzerland, France and South Africa, a multidisciplinary team lead by Michel Milinkovitch, professor at the Department of Genetics and Evolution of the UNIGE Faculty of Science and Group Leader at the SIB Swiss Institute of Bioinformatics, shows today that African elephant skin channels are true cracks due to local bending stress caused by the epidermis being simultaneously hyper-keratinised, shedding-deficient, and growing on a lattice of millimetric elevations of the skin. Using a custom computer model, Antonio Martins, PhD student in the Milinkovitch's laboratory, showed that the combination of these three parameters is sufficient to cause mechanical bending stress to accumulate in between the skin elevations during the progressive thickening of the skin until cracks are formed. The visual aspect of the cracking pattern on the skin of the African elephant bears a striking resemblance, albeit at very different spatial scales, to cracks caused by tensile stress in drying mud, in damaged asphalt, on Earth's and Mars' polar landscapes, as well as in spectacular geological formations such as the basalt columns of the Giant's Causeway in Northern Ireland and of the Devil's Postpile in eastern California. It was therefore tempting to hypothesise that the African elephant skin cracks are generated by shrinkage of the skin. However, the computer simulations performed by the Swiss team indicates that shrinkage generates heterogeneous distributions of cracks that propagate over papillae, whereas cracks on the real skin occur near-exclusively along the troughs, rejecting the 'cracking by shrinking' hypothesis. On the other hand, when the researchers implemented in their computer simulations the thickening of the skin (new layers are constantly added at the basis of the epidermis), mechanical bending stress accumulated in the valleys causing the keratinised epidermis to crack only in the micro-valleys, reinforcing the new 'cracking by bending' results. One focus of developmental biology is to describe how forms and shapes are generated by heterogeneous tissue differentiation and growth, controlled by differential gene expression across the body. However, complex morphologies can also emerge as mechanical instabilities (folds, wrinkles) caused by mismatched growth between adherent tissue layers. Famous examples are the looping of the gut and folding of the cerebral cortex. While cracking, another type of mechanical instability, is commonplace in non-living materials, it is far less ubiquitous in biological systems. The Milinkovitch's lab showed a few years ago that the pattern of crocodile head scales forms through skin folding, and that their dynamic of propagation and polygonal pattern formation is analogous to those of cracking in drying mud. Here, the Swiss team shows for the first time that the African elephant skin exhibits a myriad of channels that are not only looking like cracks, but are true physical cracks of its keratinised epidermis. Thickening of the African elephant keratinised epidermis is due to an imbalance between its formation at its base and its shedding at the skin surface. Strikingly, the Swiss team shows strong similarities between the normal skin morphology of African elephants and that of humans affected by 'ichthyosis vulgaris', a common genetic disorder (affecting about 1 in 250 people) that is known to impact desquamation (shedding of the skin) and cause dry, scaly skin. If validated by future detailed molecular and cell biology comparisons, this equivalence would then make a remarkable link between a human pathological condition and the skin of an iconic species of pachyderm. "This correspondence would also demonstrate that similar mutations that occurred independently in the evolutionary lineages of humans and elephants turned out to be unfavourable in the former and adaptive in the latter" says Michel Milinkovitch.